Hi friends! 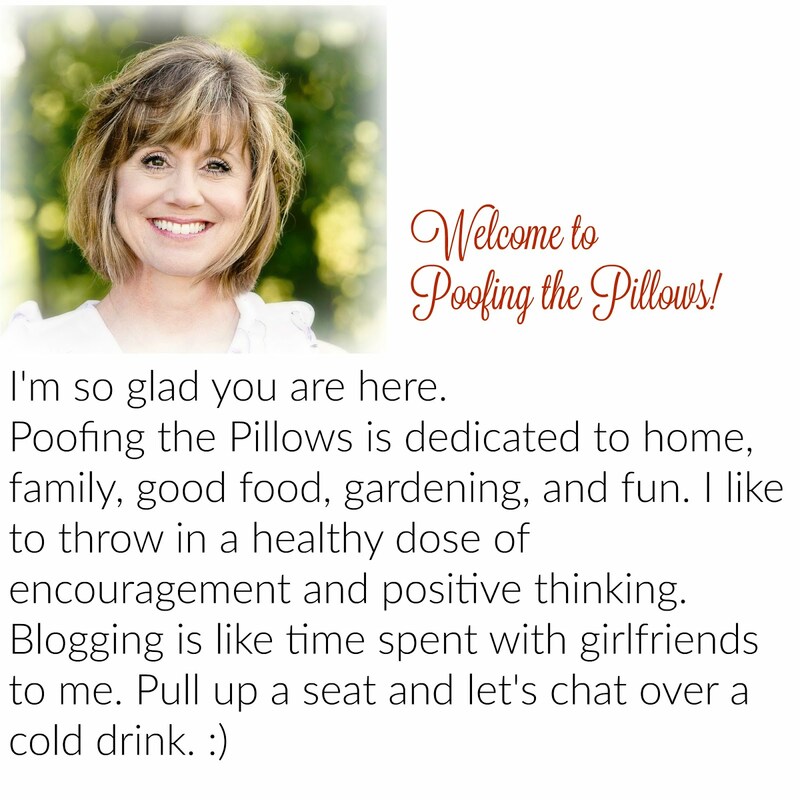 Recently a group of bloggers gathered together for friendship and creative fun. Karianne of Thistlewood Farms joined us and she generously gifted each of us with charm packs of her new Hoffman Fabrics Sweet Tea line. On that day a challenge was born for each of us to create things from her fabric. Heart attack time for me because I don't sew! With a little thought and involvement with my handsome son, we came up with three projects to share with you today. 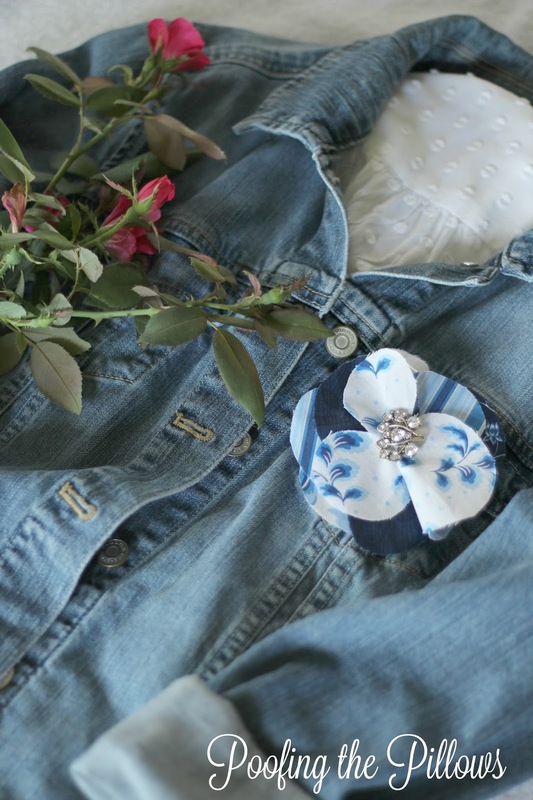 This sweet little flower now serves as an embellishment on my tried and true denim jacket. How did I make this? Four flower petals cut out of fabric with a few hand stitches in the middle. I sewed the gem on by hand with just a few stitches too. This took about 15 minutes and I love it! Of course we all love monograms and adding fun fabric to your letter of choice makes a personal statement. My son made this with Mod Podge, scissors, and a pen to trace the letter. Another 15 minute project. There are many beautiful colors in the Sweet Tea Fabric line but I was obviously a little bit in love with the navy fabrics. This challenge taught me something - don't let your lack of skills stop you from trying something new! You did great things with your fabric! My favorite is the bookmark. So clever to cut an embroidery thread packet in half like that for the tassel! 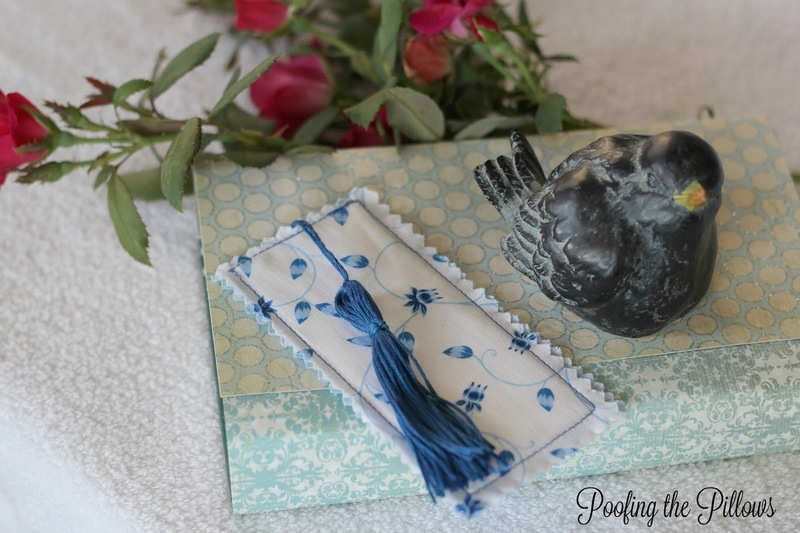 Love the projects with the charm packs....Have to use my fabric swatches on a monogram too!...love it! Very cute and easy ideas, those are the best kind! :)I especially love how the blue fabrics look with the denim jacket. So, so cute Stacey, I love all three of them and the flower pin has stolen my heart! I am thinking Haven...you know what I mean!! Adorable. I love the monogram. I can't wait for the challenge. They all turned out great! Especially love the letter. So nice and easy, but look so adorable. The flower pin is my favorite. I'm looking forward to seeing what everyone has created. Good luck on the challenge! What darling little projects and easy...yay!! Beautiful fabrics and colors, they'd make great gifts. Super Cute! I love all three but the Letter is my favorite. I don't sew either so I love how you incorporated these swatches in a unique way. Awww Stacey, all three projects are darling. The pin looks lovely on the jacket. The bookmarker is awesome. Many people who read would love that. Loving the letter. The Fabrics are beautiful. A wonderful challenge to share your creativity. Yes, the tassel made from the embroidery thread is very cleaver. Each project is nice and I like the blue and white fabric, too. Must have been a fun day. Stacey you did great and no sew wooo hooo you go girl. Love that pin. Too cute. Those fabrics are beautiful. Adorable Stacey! Love them all!!! These are so cute, Stacey. I have to admit, my eyes were playing tricks on me when I first glanced at the monogram. I kept looking at it, thinking it was a square, and the cutouts were some kind of metal wrapped around the edges. Then I looked again, and saw it as arrows (like something from picmonkey, applied on). Then, there was that ah-ha moment and I saw the K, lol! I love all three projects, Stacey, but the monogram is my favorite I think. :) Very creative...who said you have to sew to make something great? You did good. Stacey, I can't decide which project I like best. I have the navy left over from my packets and a denim jacket and some rhinestone pins, the the fabric pin may be on the horizon. Great job. All three projects are just lovely! Great job! 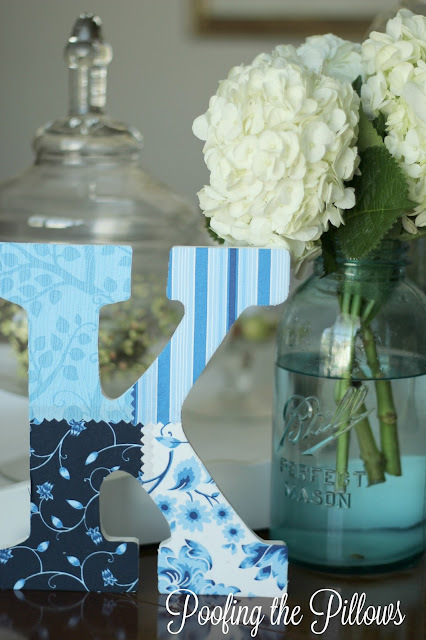 Love the projects you created Stacey, especially the K, super cute way to showcase this adorable fabric line! No sew sounds good to me! My sewing machine is probably rusty by this point anyway. Glad to hear you're having a creative summer! Love ,love all the things you made with your fabric squares. So creative and useful too. What fun all of you had together! What a fabulous collection of projects Stacey! Very clever and creative. I adore the bookmark. Have a beautiful day! Stacey, you did a great job with this challenge! All of your ideas were so cute! Your tassel creation was pretty clever. You ladies all did a great job with this! Your projects are all so easy and creative, Stacey! I love each of them! I also love your new canisters from your previous post. They're beautiful! Stacey, once again, thank you for sharing your great ideas at Your Inspired Design Link Party. You're the best! Shhhh....don't tell anyone, but I love no sew projects. And a barely sew project, too! The bookmark has marked a place in my heart! 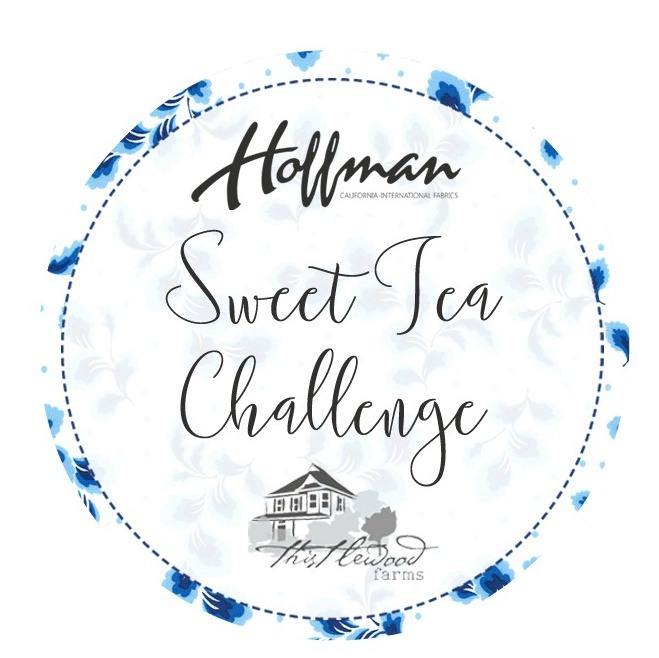 Thanks so much for participating in the challenge! Stacey, the monogram is so wonderful! Very sweet! I love the different fabrics on the monogram. I do sew but don't like to! I just made two valances with Stitch Witchery....have you ever heard of it? Cute projetcs! I'd like to make a monogram. So cute! I don't sew but I love fabric -- so when I see something that says "no sew" or "limited" -- I am a MOST happy camper! The blues are to die for!